A group of 33 conductorettes posing in front of the 16th Avenue streetcar at Prior Street barns in 1944. 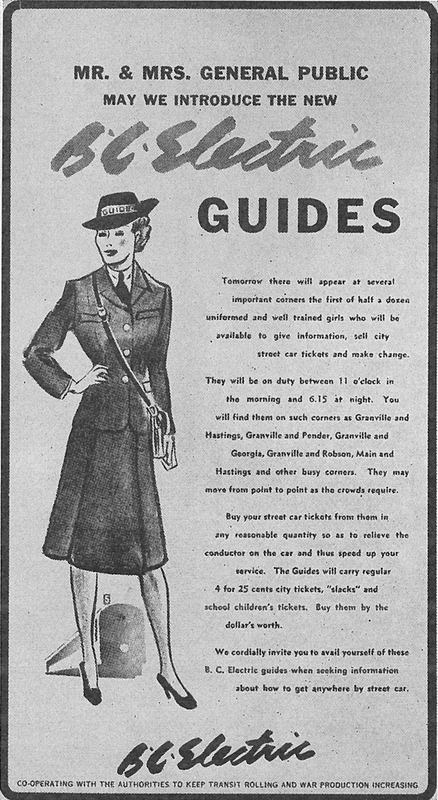 They were at first issued skirts as part of their uniform, but this image shows the transition to pants. Skirts were difficult to manage when climbing the trolley to reset the poles! Photo courtesy of the Coast Mountain Bus Company Archives. Click for a larger version. Today, I’m pleased to present the story of the conductorettes, a group of 180 women who were the only women operating transit vehicles between 1943 and 1975. And I’m especially pleased to tell you that this article includes an audio podcast containing interview excerpts from three former conductorettes. Again, Lisa Codd, the curator at the Burnaby Village Museum, helped me put this article together, based on the research of Lynda Maeve Orr, the Museum’s Assistant Programmer. It’s a continued collaboration to explore transit history and Burnaby’s archival holdings! The article continues below, but here you can hear the podcast containing interview excerpts from three former conductorettes: Pearl Wattum, Vilma Westerholm, and Edra McLeod. To listen to the podcast, press play on the player above, or download the mp3 here. You can also subscribe to our podcast via RSS. The taped interviews with the conductorettes were conducted by the Vancouver Historical Society in 1981 as part of an oral history project, and can be found at the Special Collections at the University of British Columbia. The recordings are used with the kind permission of the Vancouver Historical Society. An ad for the B.C. Electric Guide positions. Image courtesy of the B.C. Hydro Corporate Library. Click for a larger version. In 1943, the B.C. 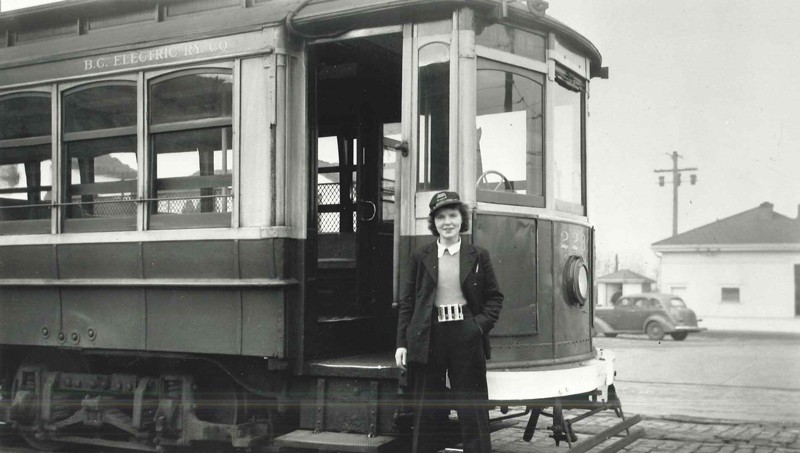 Electric Railway hired women to work on transit, to help address the labour shortage during the Second World War. Besides labour shortages, the B.C. Electric Railway was dealing with an increase in demand for its services. With gas rationing taking place during the war, public transportation was more popular than ever, and the company was pressed to stretch existing resources to the limit. 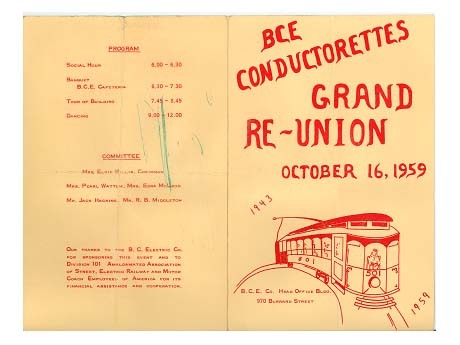 The women hired during this time were called “conductorettes.” They worked on the streetcars, and only on the Vancouver routes—you wouldn’t find them on the interurbans. The company also hired women to work as “Electric Guides,” selling pre-sold tickets at busy streetcar stops in Vancouver. As you may remember from social studies class, this was not a particularly unusual situation: women were hired into non-traditional work during the war years because of the labour shortage, which opened the door for women to work. Other Canadian and American cities also hired women to work on their streetcar systems as conductors. 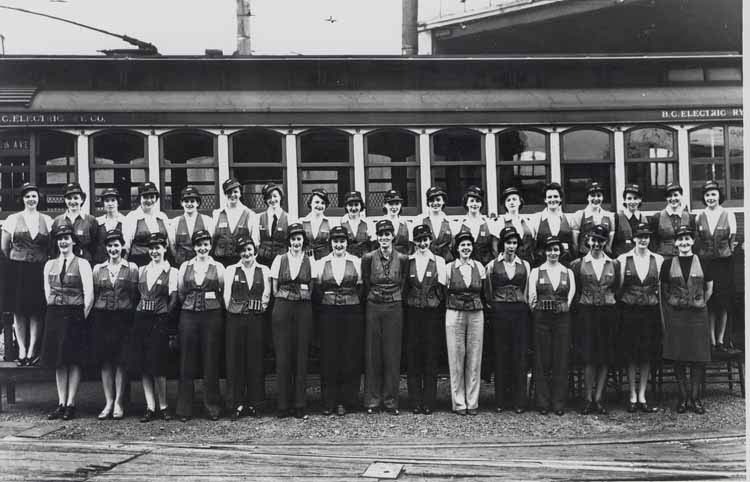 Women aged 25 to 35 to work as streetcar “Conductorettes.” Applicants will be considered on the basis of good appearance and general intelligence. The B.C. Electric Railway, however, preferred to hire married women between the ages of 25 and 35 – so said the company’s transportation manager, when interviewed by the Vancouver Daily Province in August 1943. Furthermore, the BC Electric Employees Magazine emphasized that the women couldn’t be married to just anyone — it was preferable to hire wives of men who serving overseas. The magazine stressed the women would be held to the same requirements as men: their health, vision, sight, and IQ must be up to standard. Winnifred Trounce was one of these new conductorettes. Interviewed in the employee magazine in October 1943, she explained that her husband was serving overseas, and she was both selling tickets for the BCER and looking after her two young children. She didn’t expect to be working for long, however. “It’s one thing to help fill the gaps when the men are fighting, but when they return my place will be home with my children,” she said. However, the taped interviews done with three of the women themselves do paint a different picture from the one expected by the company. Generally, they didn’t indicate that their motives were patriotism: they just jumped at the opportunity for a good paying job. The women had worked outside of the home before the war, often in jobs that offered little pay or security. January 6, 1944 - An unidentified conductorette stands at the entrance to streetcar number 223, her money changer affixed to her belt. Photo courtesy of the Coast Mountain Bus Company archives. Click for a larger version. The conductorettes did the same work as conductors: taking fares, collecting tickets, calling out stops, and working with the motorman who drove the streetcars. One of the conductorette’s duties was also moving the trolley pole if required, which sometimes involved scrambling up the side of the trolley if something was out of sorts. But as the conductorettes were first issued skirts in their uniforms, climbing the trolley could be a real challenge. Eventually, the conductorettes were issued pants as part of their uniform instead. Conductorettes also generally attended to the passengers, handling any issues that would arise on the streetcar. From time to time there would be drunks on the car, and all the conductorettes interviewed talked about handling them. In response, Pearl wound up punching him in the face, knocking him clean out. 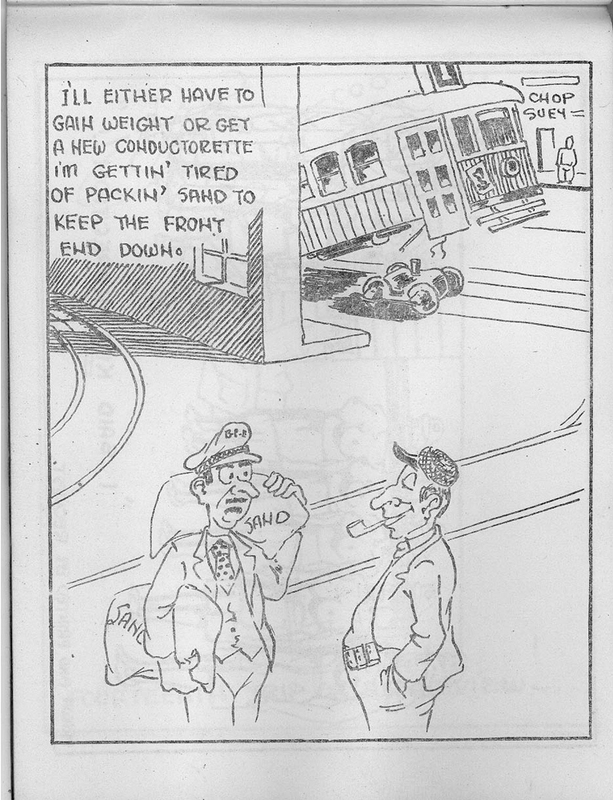 A cartoon from Slack Brakes, an unofficial humour book drawn and distributed among transit staff. The book was donated to the Museum by a retired worker named Frank Meal. Click for a larger version. In their interviews, the women report that people enjoyed them being there. During the war effort, people were accustomed to seeing women in unorthodox fields, due to the shortage of men. But while the women reported few problems working with the men at B.C. Electric, other artifacts from the time indicate that wasn’t always the case. This comic is just one mild example showing how the men made fun of the conductorettes. It was part of a joke booklet called Slack Brakes, drawn and distributed among the workers (and definitely not an official company publication). Far more explicit cartoons were in the book too, making lewd reference to their sexuality. Unusually, the conductorettes were not let go after the Second World War came to an end. And they actually kept their jobs because they had full membership in the union. From the start, the union had insisted on the women having full membership from the start, with the same rights, responsibilities, and pay as men. Making them full union members was intended to keep wages high and preserve men’s jobs after the war. When women first began working on the streetcars, the union was concerned this would bring their wages down—which typically happened when women entered male fields. They also worried that the presence of lower-paid women would threaten the jobs of men returning from overseas. The company would just hire more women at lower cost after the war. And when the war came to an end, as Vilma says, the union supported the women conductors when they fought to have their seniority recognized by the company. With a shortage of men after the war, B.C. Electric kept the women on, though many did choose to leave when their husbands returned. The women, however, were grandfathered into the organization—no new women would be hired, but the women already employed could continue. Vilma was one of the women who stayed on, and here’s what she said about that. “There were a lot of girls on during the war, but when their husbands came back a lot of them stopped. They didn’t want to go on the buses. Well, some of them, I don’t know, they didn’t seem to care about driving buses. Being by themselves. The next challenge came when the company went to one-man streetcar operation – with a motorman who did the job of both the conductors and the motormen – driving the car and collecting the fares. In the 1950s, the company combined the seniority lists, allowing conductors to become motormen and be called out on shifts according to seniority. Women were given the option of learning to drive or being let go. Edra McLeod, one of the women interviewed about her work as a conductorette in 1981, describes that Pearl Wattum, their shop steward, told them all to get out there and drive. Thirty women did learn to drive the streetcars, but the women had to prove themselves again when the streetcars were phased out and replaced with buses. Licensing was provided in Victoria, and Victoria had to give special approval to allow women to drive buses. By the 1970s, there were only two women left driving buses in Vancouver: Edra McLeod and Vilma Westerholm. Then in 1975, the company, now part of B.C. Hydro, finally began hiring women. The former conductorettes were even used as an example of women who worked. Vilma remembered it well. “During the last year I was there, or the year before last, the new girl came on, and she trained with me, and she was the first one of the new bunch,” she said. Vilma spent 32 years and 3 months working for transit before she retired in 1976. Edra retired the next year, after 31 years and 9 months on the job. Looking back, it’s easy to see that the conductorettes’ work blazed a trail for women working after them. By capably taking on this work, the women proved they could do just as much as men. Yet the conductorettes didn’t necessarily feel they were trailblazers. The three interviewed said they took the jobs for the pay—none had thought directly about the later implications of their work for women at large. Just Edra McLeod seemed to recognize, with some hesitation, that her work had made a difference to people. “[My granddaughter]came out the last day for a ride in the summer,” Edra said in her interview. “And she said that her grandmother is a living legend, someone told her this.” She then let out a laugh. 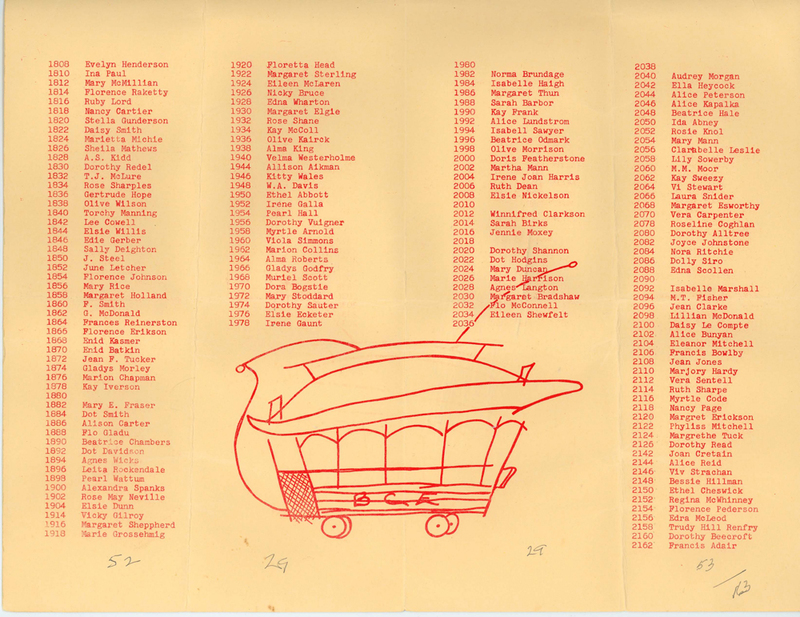 The list of conductorette names from their 1959 reunion. 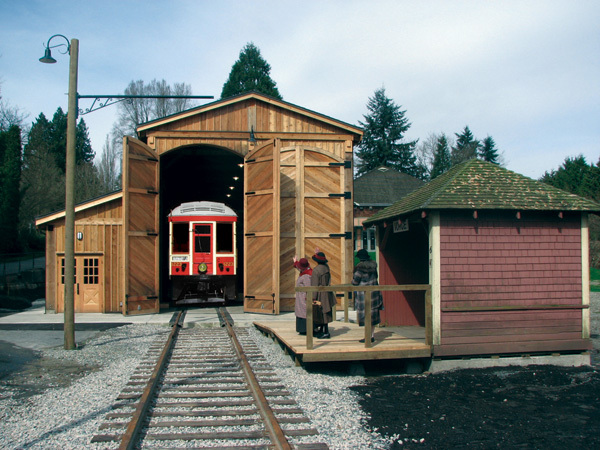 Photo courtesy of the Burnaby Village Museum. Click for a larger version. The cover of the 1959 reunion program. Courtesy of the Burnaby Village Museum. Click for a larger version. To be quite honest, we don’t know where a lot of the conductorettes ended up. Lisa has provided the program from their 1959 reunion, which features a list of all of their names – please do have a look and let us know if you know any of them. Thank you again to curator Lisa Codd for all her help with this article! Check out our earlier collaborations, exploring the history of the interurbans, in the Transit History category. Many thanks to the B.C. Hydro Corporate Library for letting us share their image on the blog. As well, the audio excerpts are provided thanks to the great kindness of the Vancouver Historical Society, and the research help of UBC Libraries’ Rare Books and Special Collections branch. If you’d like to look up the interviews yourself, please do search the UBC library records for the terms “Pearl Berrington,” “Edra McLeod” and “Vilma Westerholm”. Hope you enjoyed this look back at transit history! I’d like to see a transit goon today mouth off to Pearl Wattum. If I had it my way, she’d be in charge of transit security! If the women had to wear skirts… why couldn’t the men wear kilts??? Thanks very much for these historical articles, not to mention all the tidbits from old Buzzers that you consistently dig up. Please keep them coming! The Buzzer was already a unique publication when it was just in its paper form, but with this blog, you’ve really turned it into a first-class enterprise. Really enjoyed the story of the Conductorettes and, of course, the other articles as well. Just one wee thing, if I may … BC Hydro started hiring female bus drivers again earlier than 1975 … in fact, I started at Oakridge in September 1974.